Hi! I'm Vad. Thank you for showing interest in my photos. Although barely an interest initially, photography became passion in the recent years, earning me an additional nickname of "Paparazzi". I have three great passions in my life: photography, blues (music that is), and partying with my Irish friends. I mostly use Nikon D50 body with Nikkor 18-70 mm, 55-200 mm, and 50 mm lenses. I also have a small Panasonic DMC-LC33 point-and-shooter that was the very first digital camera I bought. Living in Montreal, I have access to such great events as the Montreal International Jazz Festival and the Mont-Tremblant International Blues Festival. There are a number of really amazing artists that hail from this Belle Province or just made it their home (such as Dawn Tyler Watson, Paul Deslauriers, NanetteWorkman, Nic Payne, Ricky Paquette, and many, many others). You can find many of them in my photostream. As for the drinking with the Irish, well... if I have to explain than what's the point? I hope you have a joyous experience looking at my stuff so feel free to live a note, or a commentary, or a testimonial. WARNING: All photographs are my own. Do not copy or distribute without explicit written approval. 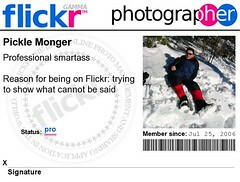 pickle.monger doesn't have any testimonials yet.